For those with smaller gardens and looking for a Dogwood plant, Cornus pumila is worth considering. Also very useful and interesting as a low growing border plant, Cornus pumila is worth considering on a number of levels. 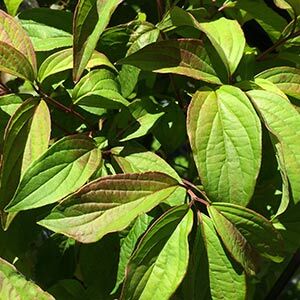 This is a rarely offered dwarf Dogwood, deciduous with good green foliage from spring through summer, turning to a rusty gold in autumn, although not brilliant autumn tones. Reaching a little over 1m in height, the flowers differ from other species, white and lace caped. Flowers are followed by small black fruits in autumn. This is a dense growing plant that naturally forms a tight clump. Requiring little to no pruning this is an easy care plant for the right position in the garden. New foliage emerges red and some of this red is help through the season, giving Cornus pumila the common name of ‘Red Tipped Dogwood’. Excellent in the garden border or planted as an edging plant where room allows. Could also be container grown. Use for underplanting taller growing deciduous trees. Full sun to a little light shade. Afternoon shade it very hot climates. Mulch around plants to provide a cool root run and retain moisture. Water newly planted Cornus pumila through the first two summers. Once established little extra water will be required. Each spring fertilise with an organic fertiliser and re apply mulch.